SSC GD Result 2019 – Staff Selection Commission is declaring SSC GD Constable Result 2019 by May 31, 2019. Vacancies have increased from 54,953 to 58,373 as per notice released on April 10, 2019. Therefore now, number of candidates qualified for PET/PST will be 5.8 lakh instead of 5.4 lakh. Check SSC GD Result 2019 for computer based exam held from February 11 to March 11, 2019 at official website ssc.nic.in and regional websites. Those who qualify PET / PST must appear for detailed medical examination. Get here complete details of SSC GD Result 2019, date, cut off, merit lists, vacancies. The SSC GD Result 2019 is for Constables (GD) in Central Armed Police Forces (CAPFs), NIA & SSF and Rifleman (GD) in Assam Rifles (AR) Examination, 2018 for 54953 vacancies in BSF, CISF, CRPF, SSB, ITBP, AR, NIA, SSF. Important dates of SSC GD Result 2019 and related events are as follows. Result is announced one by one for computer based examination, physical efficiency test, physical standards test, detailed medical examination, merit lists for selection. Check them below. Check here: Candidates can check SSC GD Result 2019 as per scheduled at ssc.nic.in and regional websites. Candidates will be glad to know that the new number of vacancies is 6% more than before. New number of vacancies are as follows. Category and gender wise distribution of vacancies are as follows. Click here to download the SSC GD Constable Vacancies 2018-2019 PDF. A total of 52,20,335 candidates applied against the 58,373 vacancies. 58.26% of registered candidates i.e. 30,41,284 appeared for the computer based examination. CBE was held in 54 shifts at 297 venues at 125 cities in 31 states and UTs. Evaluation of exam is as per official answer key of SSC GD 2019. How to check SSC GD Result 2019? Candidates can check result of SSC GD 2019 in online mode. Visit official website ssc.nic.in or official regional websites. Navigate to latest notices or result tab. If result is available, there will be a running status of the same on the website. Click on result write up and result merit lists. Read result write up to know statistics and cut offs. Read result to know list of candidates shortlisted as per SSC GD Constable Result 2019. Use Ctrl+F command to search for your roll number in result file. After declaration of computer based exam result, qualified candidates can download admit card of SSC GD 2019 PET/PST from website of CAPFs. Then they have to reach the assigned centres on given date and time. Staff Selection Commission conducts the Computer Based Examination. PET, PST, DME, RME are conducted by the CAPFs. MHA / CAPFs handle document verification. 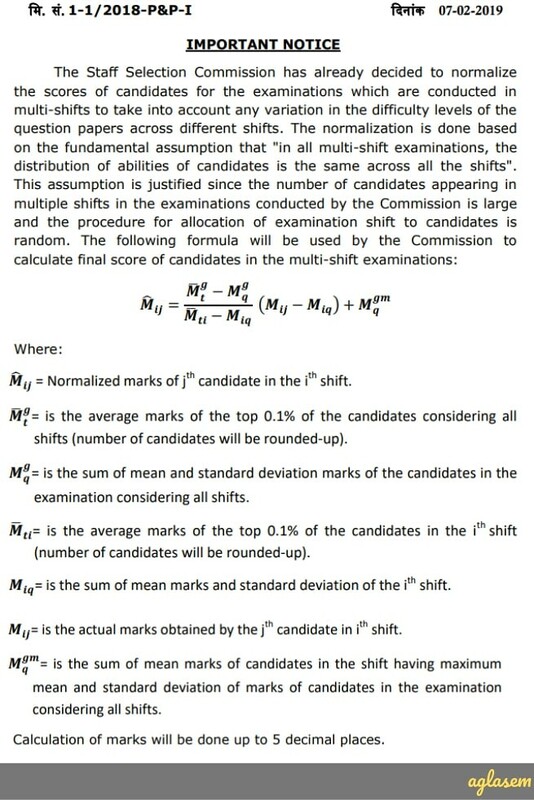 Since the paper was held in multiple shifts, marks are normalized for final score. Read the notices below for normalization details. 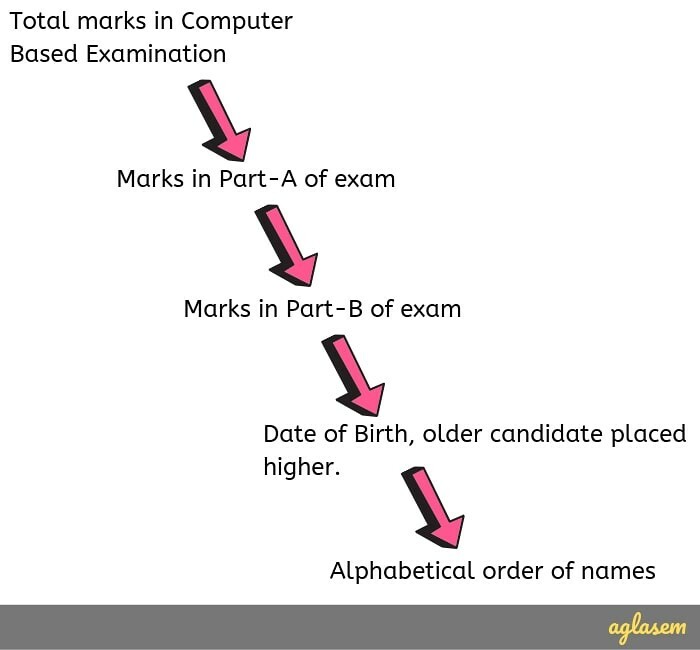 Resolution of tie cases are on basis of marks in exam, marks in part A, marks in part B, age, alphabetical order of name. During PET/PST, those who qualify height criteria (170 cms for male, 157 cms for females; relaxation applicable on some categories) can participate in race. After that they undergo biometric/ technology aided identification. Males run 5 kms in 24 minutes. Females run 1.6 kms in 8.5 minutes. Males of Ladakh region run 1 mile in 6.5 minutes. Females of Ladakh region run 800 metres in 4 minutes. Usually, CAPFs give results of PET/PST qualification at venue only. Otherwise separate lists may come on CAPF websites. If you do not qualify PST then you can submit an appeal on same day to the Appellate Authority nominated for the Centre through Presiding Officer (PO). This decision will then be final. SSC publishes final result along with force allocation on the basis of performance of candidates in CBE. PET, PST, DME are qualifying in nature. Following aspects are checked in medical examination. Unaided visual acuity (near vision) should be N6 of better eye, and N9 of worse eye. Uncorrected visual acuity (distant vision) should be 6/6 of better eye, and 6/9 of worse eye. Color vision should be CP-III BY ISIHARA. For right handed person, the Right eye is better eye and vice versa. -Binocular vision is required. Medical examination is as per Guidelines for recruitment Medical examination in CAPFs and AR’ issued vide MHA UO No. A-VI-1/2014/Rectt(SSB) dated 20.05.2015 and subsequently amended from time to time. There is complete body check as per norms laid down by the government. This includes medical test (X-Ray) chest-PA view, haemoglobin, urine routine/ microscopic examination. Candidates should note that only specific tattoos are allowed like allowed religious symbol or figures. That too they should be in inner aspect of left forearm or such allowed places. Tattoo should be less than ¼ of particular part of body. Candidates need to provide necessary and applicable documents given below, during detailed medical examination. Certificate from serving defense personnel as per format in Constables (GD) in Central Armed Police Forces (CAPFs), NIA & SSF and Rifleman (GD) in Assam Rifles (AR) Examination, 2018 notice. Undertaking from Ex-Servicemen candidates regarding completion of engagement in Armed Forces as per format. Certificate from candidates who want to get relaxation in height / chest measurement as per format. Certificate from District Collector/ District Magistrate for dependent applicants of riot victims as per format. Nativity/ Identity Certificate by West Pakistani Refugee as per format. Candidates must score a minimum cut off marks in order to be considered for short listing. Those who get that score are then placed in order of their normalised score. Then the top candidates equal to the number of candidates to be called for next step are selected and placed in the result. The minimum cut offs were same last time as well. 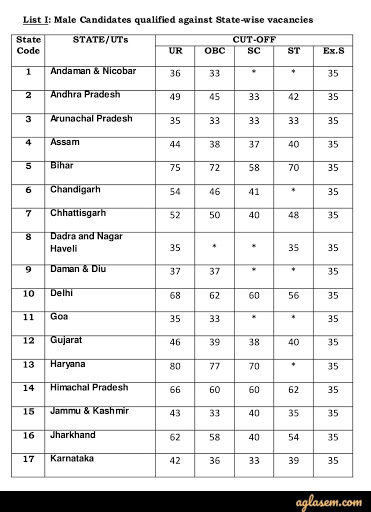 In that recruitment, the cut offs state and category wise happened to be as given in below images. SSC GD 2019 Cut Off will be announced with result. In the meantime, check last year cut offs below. 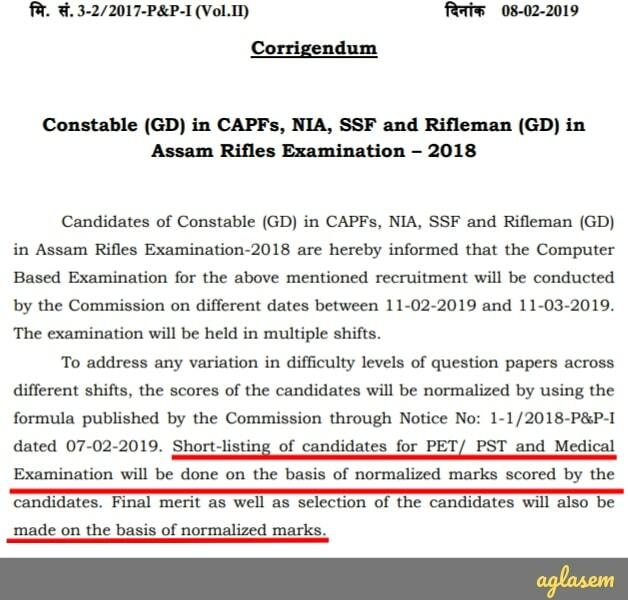 Staff Selection Commission organizes Constables (GD) in Central Armed Police Forces (CAPFs), NIA & SSF and Rifleman (GD) in Assam Rifles (AR) Examination as per rules laid down by Ministry of Home Affairs. SSC GD Constable Recruitment 2019 is for candidates who have at least a matriculation or class 10 certificate. If you succeed in SSC GD Recruitment 2019, then heartiest congratulations to you. However, if you do not, then don’t worry. You have other options to explore. Staff Selection Commission last conducted GD Constable recruitment in the year 2015-2017.